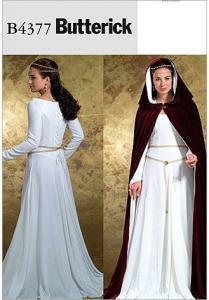 Lined, floor-length cape has hood, gathered neckline and decorative closure. Floor-length dress has close-fitting, lined, drop-waist, shaped bodice, with princess seams, long sleeves, flared skirt with godets and back zipper closing. Purchased trim.